Previously, we shared an amazing breakthrough: The ability to store data on slivers of quartz glass for 300 million years. Now, you don’t have to worry about what will happen to your data after those 300 millions years are up—researchers have upped the storage and lifespan of the quartz glass. Your data can be stored safely for 14 billion years. With this in mind, your data is essentially safe forever. Researchers at Southamton University in the UK have developed the technique of storing data digitally using laser light. 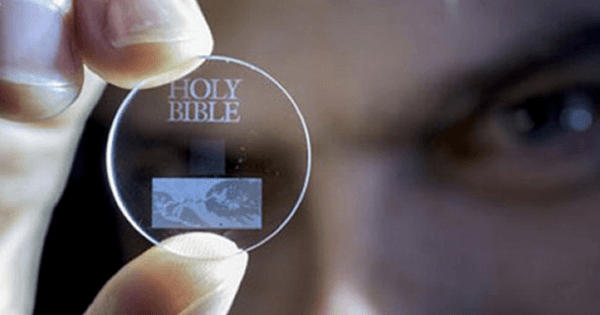 360 terabytes of information can fit on one sliver of nanostructured quartz. With this tech, we can store literally the whole of human history. The technique uses femtosecond laser pulses to write data in the 3D structure of quartz at the nanoscale. The pulses create three layers of nanostructred dots, each just microns above the other. The changes in the structure can be read by interrogating the sample with another pulse of light and recording the orientation of the waves after they’ve passed through. Notably, this is referred to as a 5D storage device. These include the three dimensions of space, which are responsible for describing the physical location of the dot, and two additional dimensions that are encoded by the polarity and intensity of the beam that creates the dot. The storage system, in addition to being long lasting, is also pretty safe—the quartz can withstand up to 157 degrees Celsius (350 degrees Fahrenheit). In the same way that the Pioneer Plaque is meant to be a communication tool between us and any extraterrestrial life, these tiny storage systems could someday inform other beings (maybe our far, far, far off descendants) about Earth and humanity after we are long gone. This new advance in storage makes the technique a genuine means of archiving vast quantities of information in perpetuity. We no longer have to fear the loss associated with tragedies like the Library of Alexandria.